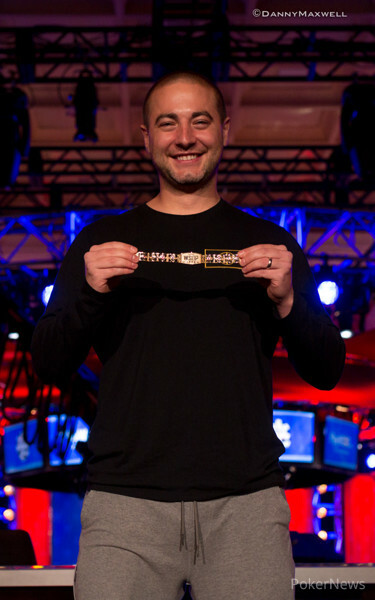 Chance 'BingShui' Kornuth has won Event #63: $3,200 WSOP.com ONLINE No-Limit Hold'em High Roller for $341,598 and a World Series of Poker gold bracelet. It took just under 12 hours on the virtual felt but at just past 3am, Kornuth defeated David 'bewater' Goodman heads-up to claim the title. A record-setting field of 480 entries gathered on Saturday evening. This was only the second running of the WSOP.com Online High Roller but this year easily surpassed the mark of 424 set in 2017. There were 356 unique entries with 124 rebuys creating a prize pool worth $1,459,200. The top 63 spots walked away with a prize. Anyone who made the money was guaranteed at least $5,836. 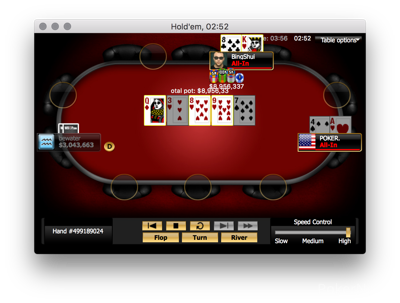 Hand-for-hand play on the bubble was reached about seven hours in and lasted for a full level before the tournament lives of three players were claimed on the same hand. According to the tournament lobby, 'uvaseca' busted in 63rd place, presumably having the most chips between the three and scored the min-cash. While 'kingstayking' in 64th and 'ValueMerguez' in 65th received nothing. 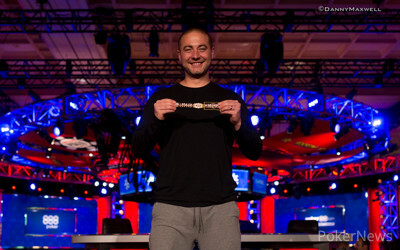 Anthony 'heheh' Zinno also received a min-cash after busting in 61st place. A huge cooler gave Kornuth a monster chip lead when he clashed with fellow big stack 'Hopelep'. The two got it in preflop aces versus kings and Kornuth spiked a king on the flop to drag a 3 million chip pot and 'Hopelep' was out in sixteenth place. The final table was formed in under a level from there as a whirlwind of bustouts claimed the lives of Alan 'TheJews' Sternberg (15th), 'TDu2Death' (14th), 'swansong79' (13th), 'ForlorarDu' (12th), 'jwest411' (11th), and '2fly2die' (10th). Goodman and Kornuth had piles more than their counterparts when the final table began and they easily knocked off their competition. Pete 'petechen' Chen was the first to go. Both he and Timothy 'poker.' Nuter flopped a pair of kings and the chips went in. Chen was dominated though and couldn't improve. Kornuth knocked out Jonas 'LobyPewis' Macoff moments later, followed by Justin 'kingfortune' Liberto busting in seventh. Goodman and Kornuth teamed up to take out Taylor 'ReadyGambo' Black in sixth. Both called the sub-ten big blind shove and Goodman made trips with king-queen to best king-jack. Forced all in out of the big blind, Frank 'flcrivello' Crivello had to put himselve at risk with three-deuce and a pair of eights was enough for Nuter to score the knockout. Noah 'ThePunter' Bronstein had his deep run end in fourth. The final three players played for over an hour before a crack was formed. As Kornuth pulled away, Nuter's stack kept shrinking. Eventually, Kornuth shoved blind versus blind and Nuter called it off in the big blind with ace-four. Kornuth hit an eight with king-eight and faded a flush draw on the river to set up the heads-up battle with Goodman. Kornuth held a more than five-to-one chip advantage as the battle kicked off and Goodman would not be able to gain anything back. The two played for about 15 minutes before the final hand was dealt. With a king-high, three club board completed, Goodman led out with a less than half pot bet. Kornuth shoved and after a few moments in the tank, Gooodman called with just a pair of tens. Kornuth had rivered a set of sixes and the final pot was dragged. There is still plenty of action to come at the 2018 World Series of Poker. Stay tuned to the PokerNews blog as the PokerNews Live-Reporting Team will be on the floor providing live coverage of every event until the series wraps for another year. With 889,900 in the middle and a completed board reading , 'bewater' bet 362,000 and 'BingShui' raised all in. 'bewater' took a few moments, a decision for their tournament life, and eventually made the call. 'BingShui' tabled the for a rivered set of sixes and 'bewater's was mucked. 'bewater' received $212,021 for their runner-up finish. 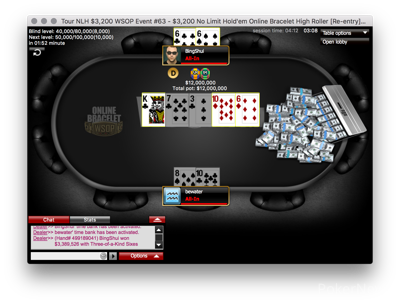 A top prize worth $341,598 and the WSOP.com Online High Roller bracelet goes to 'BingShui'. 'BingShui' open-jammed out of the small blind and 'poker.' put themself at risk calling off the remainder of their stack in the big blind. The board ran out and 'poker.' was eliminated in third place. 'BingShui' opened to 160,000 on the button and 'bewater' defended the big blind. A flop fanned out and 'bewater' check-raised a bet of 162,500 to 482,500 and 'BingShui' called to see the hit the turn. 'bewater' bet 623,500 and 'BingShui' called. The peeled off on the river and 'bewater' check-folded to a bet of 924,400. 'bewater' opened to 120,000 on the button and 'BingShui' called out of the small blind. Both players checked a flop and the hit the turn. 'BingShui' check-called a bet worth 142,500 and the was delivered on the river. After 'BingShui' checked again, 'bewater' bet 386,500 and 'BingShui' made the call. 'bewater' tabled the and lost to the of 'BingShui'.